I greet you warmly in the peace of Christ! I am pleased to welcome, for the first time, a delegation of the Organization of African Instituted Churches. I thank you for your visit and for your willingness to seek closer ties to the Catholic Church. Your communities, in their relatively short history, have been marked by the struggle for independence on the African continent, and by subsequent efforts to shape societies of justice and peace, capable of defending the dignity of the great variety of African peoples. Sad to say, the promise of progress and justice held out in that process of liberation was not always fulfilled; many countries are still far from peace and from an overall economic, social and political development that can ensure suitable living conditions and opportunities for all their citizens. 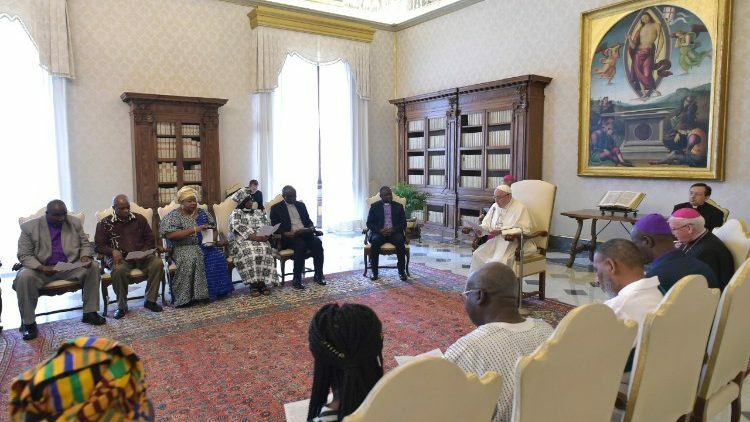 You are well aware of the challenges that Africa as a whole faces, as well as those faced by the different Churches in carrying out their mission of evangelization, reconciliation and humanitarian assistance. In particular, you are conscious of the enormous challenge of providing stability, education and employment opportunities to the young people who form such an important part of African societies. Africa today has been compared to the man who went down from Jerusalem to Jericho and fell into the hands of robbers who stripped him, beat him and went away, leaving him half dead (cf. Lk 10:30-37). The basic question facing us is how the Christian message is good news for the people of Africa. As a response to the desperation of the poor, the frustration of young people and the cry of pain of the elderly and the suffering, the Gospel of Jesus Christ, passed on and lived out, translates into experiences of hope, peace, joy, harmony, love and unity. If we are truly convinced that Africa’s problems can be more easily resolved by drawing upon the continent’s human, cultural and material resources, it is clear that our Christian duty is to accompany every effort to favour a wise and ethical use of those resources. In particular, what is urgently demanded is a shared commitment to promoting peace processes in the various areas of conflict, as well as to concrete forms of solidarity towards those in need. It is the duty of church leaders to help individuals to pool their energies and put them at the service of the common good while defending the dignity, freedom and rights of all. More than ever, all Christians need to learn to work together for the common good. Although significant disagreements may exist between us on theological and ecclesiological issues, there are many areas where the leaders and members of the various communities of the Christian family can set common goals and work together for the benefit of all. Especially for the most underprivileged and vulnerable of our brothers and sisters. The African peoples possess a profound religiosity, a sense of the existence of a Creator God and a spiritual world, the importance of the family, love for life, children as God’s gift, respect for elders, duties towards others, near and far… Do these religious values and these principles of life not belong to all of us as Christians? On the basis of them, then, let us express our solidarity in interpersonal and social relationships. A particular task of Christians in African societies is that of fostering the coexistence of differing ethnic groups, traditions, languages and religions, a task that often meets with obstacles due to grave mutual antagonisms. For this reason too, I would like to encourage greater encounter and ecumenical dialogue between ourselves and with all the other Churches. May the Holy Spirit shed his light upon us, so that we may succeed in discovering how best to promote cooperation between all – Christians, traditional religions, Muslims – for the sake of a better future for Africa. Dear friends, I thank you once more for your visit. It is my prayerful hope that these days spent in Rome, the city of the martyrdom of the Apostles Peter and Paul, will help strengthen your conviction of the firm will of the Catholic Church to do everything possible, together with her ecumenical partners, to promote the Kingdom of justice, peace and fraternity that God desires for all humanity. May he look with love upon you, your families and your nations. I ask you too, please, to pray for me, for I have great need of it. Thank you!